(Tampa, FL) Fresh from leading Valdosta State to the 2018 NCAA Division II championship with the nation’s No. 1 ranked scoring offense in the division (52.0 ppg), Florida native Kerwin Bell has been named the Bulls’ offensive coordinator/quarterbacks coach, USF Head Coach Charlie Strong announced Thursday. Bell, a former standout quarterback and SEC Player of the Year at the University of Florida (1984-87), comes to USF after 12 seasons as a successful head coach leading programs at Valdosta State (2016-18) and Jacksonville University (2007-15) and a 14-year playing career in professional football, which included stops with the Tampa Bay Buccaneers (1989) and Miami Dolphins (1988). Strong and Bell were first part of the same program during the 1983-84 seasons at Florida, where Strong was serving in his first coaching position as a graduate assistant and Bell was a walk-on quarterback. Bell, a native of Mayo, Fla., earned the Gators’ starting quarterback job as a redshirt freshman in 1984 and went on to earn SEC Player of the Year honors after leading the Gators to a 9-1-1 record, SEC championship and top five national ranking. Bell most recently served three seasons as the head coach at Valdosta State (2016-18) where he guided the offense and led the Blazers to a 27-7 record, a school-record 15 straight victories, two Division II playoff appearances and conference and national championships in 2018. He was named the 2018 Gulf South Conference Co-Coach of the Year after leading VSU to a 14-0 record (the first unbeaten season in program history) and a 49-47 victory over Ferris State in the Division II National Championship game, the program’s first title since 2012. Bell’s 2018 offense led the nation in scoring (52.0 ppg), ranked second in first downs (341) and was fourth in total offense (523.9 ypg), red-zone offense (.901) and pass efficiency (167.37). Bell led VSU to runner-up conference finishes in his first two years guiding the program and went 8-3 with a playoff appearance in his first season at the helm in 2016 as the Blazers led the nation with 27 interceptions. Prior to VSU, Bell led Jacksonville University for nine seasons, guiding the Football Championship Series program to a 66-35 record and three Pioneer Football League championships. Also serving as offensive coordinator and quarterbacks coach, Bell was named the 2008 PFL Coach of the Year and an Eddie Robinson Award finalist after leading the Dolphins to a 9-4 record and conference title. Prior to taking over the Jacksonville program, Bell led Trinity Catholic High School in Ocala, Fla, for six seasons (2001-06), earning a Florida 2B state title in 2005 and runner-up finish in 2006. Bell was selected in the seventh round of the 1988 NFL Draft by the Miami Dolphins, beginning a 14-year professional career that saw stops with the NFL teams in Miami, Atlanta, Tampa Bay and Indianapolis as well as stops in the Canadian Football League (where he passed for 19,538 yards and 101 touchdowns in nine seasons) and the World League of American Football. Bell earned a degree in psychology from the University of Florida in 1987. After beginning his career at UF as a walk-on, he was inducted into the University of Florida Athletics Hall of Fame in 1997 following a four-year career (1984-87) that saw him pass for 7,585 yards and 56 touchdowns. He was ranked the No. 26 greatest Gator of all-time from the first 100 years of UF football in 2006 by The Gainesville Sun. (Tampa, FL) USF’s football series with the Florida Gators will begin one-year earlier than previously scheduled and now open in Tampa, USF Vice President of Athletics Michael Kelly announced on Thursday. Kelly also announced the addition of a seventh home opponent to the Bulls’ 2019 slate. The Bulls’ three-game series vs. Florida, previously slated to begin in 2022 in Gainesville, will now get underway on Sept. 11, 2021 with a clash in Raymond James Stadium. The Gators first visit to face USF in Tampa had previously been scheduled for the 2023 season. The Bulls will complete the series with the Gators with two previously announced games in Gainesville on Sept. 17, 2022 and Sept. 6, 2025. Kelly also announced the addition of a game vs. South Carolina State to the Bulls’ 2019 home schedule, bringing the home slate to seven games. The Sept. 14 game vs. the Bulldogs in Raymond James Stadium completes USF’s 2019 non-conference schedule, which also includes home games in the season-opener on Aug. 31 vs. Wisconsin and on Oct. 12 vs. BYU as well as a Sept. 7 road date at Georgia Tech. The Bulls also have future non-conference series vs. Power 6 opponents scheduled against Texas (2020, 2022, 2024), N.C. State (2021 & 2024) and Louisville (2022, 2024 & 2026), with all making visits to Raymond James Stadium. (Tampa, FL) No. 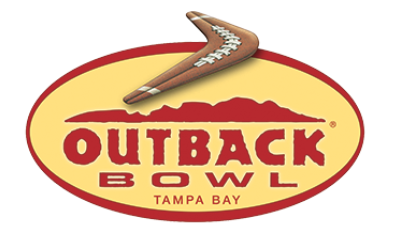 20 Florida dominated the Outback with stingy defense and a persistent offense that did its job, too. Chauncey Gardner, Jr., returned one of his two fourth-quarter interceptions 58 yards for a touchdown, and graduate transfer Austin Appleby threw for 222 yards and two TDs to pace Monday’s 30-3 rout of No. 21 Iowa. Iowa’s C.J. Beathard led an early field goal drive and managed to get his team close to the end zone on two other occasions. Florida’s defense stiffened both times, stopping the Hawkeyes on downs at the Gator 3 in the second quarter and forcing them to settle for a 30-yard field goal that sailed wide right midway through the third quarter.